I’ve tested a number of Li-Ning badminton rackets this year. They’ve all been good quality. The big issue with Li-Ning is that players do not understand them as there are no specifications available and the naming does not have a meaning. I am hoping to test as many Li-Ning rackets as possible to provide a better understanding of these superb rackets. The Li-Ning N9II badminton racket arrived unstrung in a fabulous red cover. 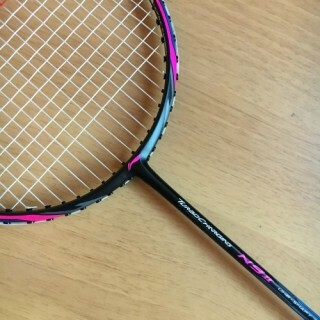 The racket is finished primarily in a black matt with pink and electric blue decals – really nice! There are no markings on the racket for weight or grip size but I can tell this is a 3U (weight 85-89g) G4 grip size. it’s a shame Li-Ning rackets are not available in a G5 grip size because I believe they are more suited. This is a medium-medium stiff flex, more-or-less even balance. The aerodynamic frame feels fast so let’s see how this racket performs. Whenever you pick up a Li-Ning racket, there’s always a nice feel to it, irrespective of the specification. It’s hard to understand why, but there’s just something about their rackets that always seems right. With N9II being an even balance racket, I could almost predict how the racket would feel. Clears were stroked easily without me having to try too hard to find a good length. The aerodynamic frame ensures the head speed is fast and highly manoeuvrable. It’s a faster frame compared to Arcsaber 11. There’s a different feel on drop shots. Less weight in the head means the racket can be called upon to execute faster, therefore presenting a quicker, snappier alternative in the shot execution. The feel on the stringbed was firm, without lagging. There were no timing issues to report. Generally, an even balance racket won’t hit as hard as a heavier headed racket, although this depends on the ability of the player to generate racket head speed. As such, N9II performed very well in the smash department although didn’t quite hit the speeds achieved with Li-Ning N99. That said, an even balance racket doesn’t profess to be the best at everything, it is extremely good in all areas. N9II certainly fits into that category which makes it an excellent doubles racket. The flatter game is where N9II shows its class. There’s a confidence with this racket that you could time these shots well all day without the onset of early fatigue. Swing speed is really quick. As expected, the Li-Ning N9II badminton racket performed well in defence without having to overly work the hands. In defence, timing the lift is important. This is easy to execute with N9II and there’s enough weight in the head to feel where the racket is moving to, without losing control. There’s also enough weight for a solid platform to confidently block returns. Sometimes the light frames lack this. N9II is very nimble at the net. There’s plenty of control to execute tight net shots combined with that extra speed when called upon for pushes, interceptions and net kills. The key here is being able to play certain shots with the right amount of speed that allows you to stop the racket head in time. This is where the even balance frame scores well, again providing that best of both feel. Li-Ning N9II is a very good even balance racket. It performs as you would expect a racket with these specifications should and looks great too! RRP is huge £210. Retailers in the UK are selling this racket for around £160 which is on the high side when compared to Arcsaber at around £135. This can be an important consideration when choosing a racket with similar specifications and sadly I suspect that on many occasions, N9II will lose to the Yonex on the basis of price, even though on balance, it’s probably a slightly better racket. However, this is where Li-Ning as a brand will lose out which is a shame because the quality is so high. It’s such a shame that marketing for the Li-Ning brand is so poor because the quality is very high indeed. I would love to test more racket from this brand but they definitely need a major overhaul of their ranges and make them understandable. They also need to provide a lot more information about each racket so that we can become familiar with them and understand which specs may be more suitable. On balance, I will award Li-Ning N9II badminton racket a four star rating. In my opinion, it is faster than the Yonex equivalent which helps it perform better. However, the price and poor marketing have reduced its appeal, which is such a shame. N9II deserves more and should be included on your must try list if the specification meets your requirements. Badminton has always been my most favorite game since childhood. The analysis you did on this badminton racket is really impressive. Along with the perfect badminton rackets, in my opinion, one also needs custom shoes that are designed especially for playing badminton. I agree. Players should invest in badminton branded shoes because they are designed for the sport. Nice review Paul, would you be able to compare the N9 II with the Jetspeed 10 and Jetspeed 12 ? I am considering purchasing this racket but have never played with it but I do own the JS10 and JS12 (thanks to your reviews) and I love the JS10 especially. I was a touch disappointed with N9II, hoping it would be so much better to play with. It’s a beautiful racket but I just can’t place my finger on why it didn’t light up all of the lights for me. JS10 is much faster, lighter all around and packs a punch. JS12 is a touch more flexible and a nicer feel on the stringbed. Sorry I can’t be more detailed. I have rackets for enough time to write a review and then hand them back. I would prefer to compare rackets I have available and then i can say much more. Great Article , its been long time i visited your blog post and nice to see Li Ning Racket review. I think Chen Long is using this racket , Li ning N 9. I also tested the racket and found that power of racket is not up to the mark and speed is also not goood as compare to Yonex Arcsaber 11 your comment Plz…. Chen Long is using N90 IV having previously used N99. I’m glad you agree with my thoughts on this racket. It’s a quick frame and I considered it was fast but just lacked a bit of power which Arcsaber has. Jospeh – I can only review rackets I am sent. So far I have been unable to get hold of the Astrox.